I have been decorating my house for Christmas. I do not have family over at my house for Thanksgiving so I like to enjoy having all of my Christmas stuff up a little longer. I am still getting my house together so look for a post with pictures later. I made my first deco mesh wreath! Unfortunately, the door hanger I have will not allow my door to shut so I need to go get another one asap. I promise as soon as I get my house in order to post pictures! I took a short break from decorating and tried to wear my hair in a sock bun. The first try was a success!! I can't believe how well it is staying with nothing but the sock in my hair! Brad if you are reading this and find a sock without a match it is now toe-less and in my hair. If y'all haven't tried to take pictures of the back of your hair to post it is a little difficult. I might have to wait on Brad to get home to show y'all how it turned out. Have you been inspired to try things off Pinterest? I can't wait to see your sock bun! My hair is too think to do that I think! 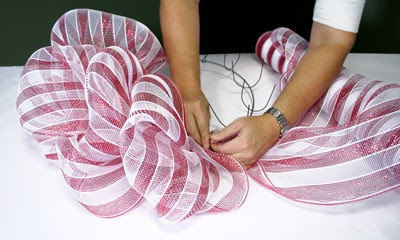 Wasn't that deco mesh wreath fun and easy?? I did my first one a few weeks ago! I have been skeptical to try the sock bun (let's be honest, the lady from the you tube video seems a little cookoo for coco puffs), but you are totally rocking it! Need to find a sock tonight, and try it!